Bathroom design and decor has become such a hot topic it’s on par with bedroom and kitchen styling. Far from purely functional, our bathrooms have become a sacred space to take a moment, wind down and well, just breathe. 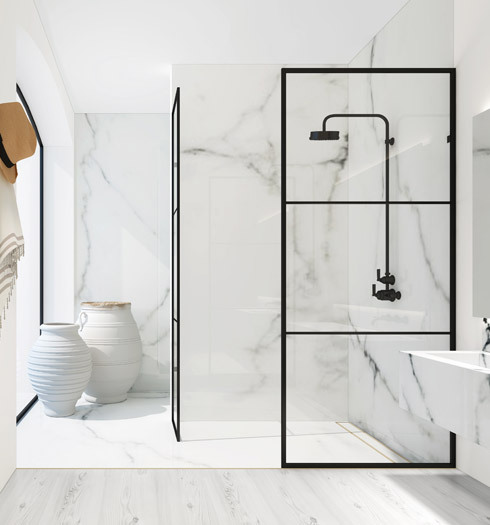 If you’re considering installing a new bathroom or transforming an existing one, it can be hard to know where to start, especially with so many fresh design ideas bubbling to the surface every year. 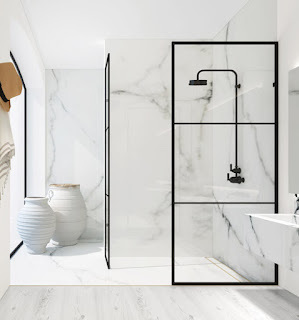 As leading bathroom designers and installers in the Amersham and Windsor area, we’ve sifted the style sections and industry blogs to bring you the top bathroom trends for 2018. Blurred Lines – Straight lines are out, and curvaceous tiling is in. Waterproof and resilient, tiling plays a leading role in any bathroom. But whereas large format tiles and linear subway tiles have previously taken centre stage, patterned tiles are stealing the limelight. 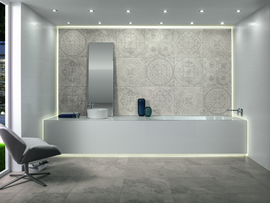 Several tile designers have released ceramic tile collections with vintage architectural motifs and patterns. For inspiration, browse Porcelanosa’s Antique tiles featuring a Mediterranean pattern based on Hydraulic mosaics typically found in 20th century Catalan architecture. Available in soft shades of grey, brown, blue and silver, these tiles are ideal for creating a decorative floor or feature wall. For understated styling, Villeroy & Boch’s Newtown tiles bear a subtle Victorian pattern from Germany’s Gründerzeit era. Each tile is a robust 60cm by 60cm and has the warm, worn look of natural stone, providing the perfect backdrop for a bath, shower or wet room. If you’re craving a colour kick, Villeroy & Boch have also released the vibrant Cherie bathroom tile. Its Baroque style pattern in jade green make it a classic, elegant wall covering. To avoid pattern overkill, opt for half tiled walls, rather than fully tiled. How can I get the look? 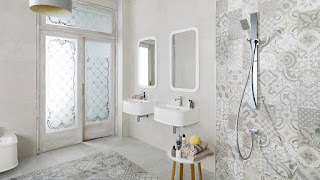 Patterned tiles can look amazing in bathrooms but achieving balance is crucial. Too much pattern will feel chaotic but used sparingly it will give your bathroom scheme a stunning focal point. To see the tiles mentioned above and how they might work in your bathroom, call into our Windsor or Amersham bathroom showrooms. Villeroy and Boch Newtown and Cherie tiles, Porcelanosa Antique tiles. The Boutique Hotel Bathroom - Replicating a boutique hotel bathroom involves creating a gloriously indulgent space and peppering it with personal quirks that make it uniquely yours. The first step to achieving boutique chic is choosing the right fittings, which unlike pattern tiles, come under the bracket ‘more is more’. A boutique bathroom is shamelessly luxurious, characterised by freestanding baths, his and her basins and vanity units, walk-in showers and, of course, statement rainfall showers with more jets than Heathrow. It’s also about personalising the look with furniture and accessories that you love, such as bringing in a favourite chair and piling it with books, adding unusual lighting fixtures or a retro industrial mirror. A high-end boutique hotel bathroom starts with a good pinch of professional planning. Our bathroom designers can come to your home, measure up and determine the best use of space, so you can explore all layout possibilities – you’d be amazed how many smaller bathrooms can accommodate a standalone bath or double basin. For freestanding bath ideas, take a look at Waters of Ashbourne baths on display at our Windsor and Amersham showrooms, or Villeroy & Boch’s oval-shaped Aveo bath, available at our Windsor showroom. If you’re after an otherworldly showering experience, they don’t get more enjoyable or drench-worthy than Hansgrohe’s overhead showers. As well as boasting expansive shower heads, they offer a range of water sensations, from soothing ‘Rain Air’ with droplets like warm summer rain, to ‘Whirl’ which gently massages tired and tense muscles. Our best-selling Hansgrohe Raindance is available in both our showrooms, so come in and feel the difference for yourself. If you’re keen to introduce a sumptuous walk-in shower or wet room, Majestic’s glass shower enclosures and wafer-thin shower trays look incredible in contemporary and classic settings. For an industrial edge, check out Majestic’s new range of metalcraft frames blending crittall-style black trims and glass. Enjoy blissful bathing with Villeroy & Boch’s freestanding Aveo oval bath. Hansgrohe’s Raindance shower provides a sumptuous showering experience. Majestic’s Horizon shower enclosure with matt black frame has an elegant industrial edge. Ready to make your smallest room the most popular room? For more cutting-edge bathroom ideas, call into our Windsor or Amersham bathroom stores or arrange a free home design appointment here.